I used to think that perspective is all about stereotypes, because I had an art unit about stereotypes. I did not really understand what it means and could not grasp the main concept . However, now I know that perspective is all about viewpoints of different people. I learned that it is important to understand people’s perspective, so that you are not self centered. For example, thinking about why he or she said that. Or maybe when I am in a fight, I can think about the perspective of the other person and understanding them. I know this is a hard thing to do as I am still 14 years old. But as I develop as a person, I will try to get better at it. Better grammar such as come comidas nutritivas. I used to mix up these things. I learned new strategies such as using quizlet too memories new vocabularies. Because of this, I was able to use many unit vocabularies in the exam. I started to study more since memorising different forms of conjugation in one day is impossible. I am not getting good grades so I want to improve from learning from my mistakes. According too Wikepedia, “comedy (from the Greek: κωμῳδία, kōmōidía) refers to any discourse or work generally intended to be humorous.” We all know what Comedy is, as we see it on T.V. shows, movies, theaters and even on social media. However, was comedy different few thousands years ago? This blog post shows the history and analyse different types of comedy in different places in history, looking at how it changed and how it developed. 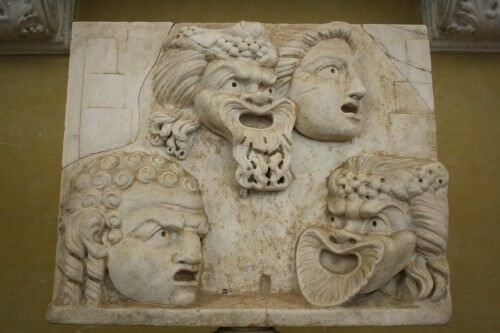 The Greek comedy can be divided into mainly 3 prats. Old comedy, middle comedy and new comedy.The origin of comedy, dates back too 425 bc in ancient greek by a man named Aristophanes. He developed an interesting type of comedy named “statyr plays”, a type of play based on Greek Mythology. Reported by the Ancient History Enclopedia, all performers were male professional actors, singers, and dancers and they were helped in their endeavor to represent a vast variety of human and non-human characters by wonderful costumes and highly decorated face masks.” People dressed in costumes and wear masks and paintings on its face too. Around 400BC-320BC. The middle comedy presented literary, political, and philosophical commentary, but the mythological “fantacy” in the old comedy was still popular as well. However after the middle comedy from around 320BC to the mid 3rd century, which incorporate fictional average citizens and has no superpower nor heroic power that are well known in the Old comedy. Menander was one of most comedians in this time, as he brought in some humour, but also gave audiences an accurate, while not greatly detailed, picture of life. In other words, more realistic comedy in comparison with the old comedy. Well known comedy during the Medieval times were the Elegiac comedy and the Jester comedy. First of all, the Elegiac comedy was a genre of medieval Latin literature/drama in which was based on sexual conquests. These dramas were usually a man overcoming obstacles and rivals in order to get the woman he wants. These comedies were often influenced by Greek”New Comedy”. The entertainer often showed of their “latin skills”, using advanced grammatical structures and create puns in order to entertain the audience. Second of all, during the medieval Renaissance and the the Jester comedy was a form of comedy in which a jester, court jester or a fool. Jesters entertained the audience throughout different skills. Jesters often performed at fairs,markets they also entertain a king or nobleman in the middle ages, to bring smile when they feel angry. However, sometimes when the Jesters were not successful at entertaining them, they will often be punished . An example of this is when Queen Elizabeth is said to have rebuked one of her one of her fools. Jesters usually wore a motley(i.e. parti-coloured) coat. These motley usually had brightly coloured clothes with mysterious patterns in them to make the Jester look mysterious, stupid and funny. In medieval times, jesters entertained with a wide range of skills:These included songs, music, and storytelling, acrobatics, juggling, telling jokes, and magic. These skills were applied in a comical fashion in order to make it humorous. The Medieval jesters of the Middle Ages can be compared to the circus clowns of today, which also plays a smilier roles as a Jester. A period in which advanced technology, created extraordinary pieces of artwork and music and increase in trading. This period is referred as the “Renaissance period”. Comedy then was different to what we refer as to now. People think modern comedy is supposed to be funny. However in the Renaissance period, comedy was a play that had a happy ending. These endings were usually a marriage, or a union with an important one. A great play writer during this period is William Shakespeare, a play writer that wrote most of the famous plays such as the Romio and Juliet. Play created by him usually had an happy ending. Because of this, Renaissance comic is also referred as the Shakespearean Comedy. Melodramatic comics, also known as Melodrama is a drama is play or a drawings that appeal strong emotions of the characters. In other words, over exaggerated emotions. Furthermore, this type of drama usually had strong stereotyped characters, in which they were characterize in detail. Melodrama was usually accompanied by music. Circus Comics is a performance of acrobatics, clowns, trained animals. The main purpose of the circus is to amaze the audience and to entertain the audience. Acrobatics includes Juggling, equilibristics and Vauling. Trained animals do stunts such as tigers and lions jumping in a circle of fire, Elephant balancing things and even magic tricks using birds. Phiipo Astely is said to be the “father” of circus when he opened the first circuss in 1768 in England. Cinematic comics are films that are centralized in humour. These films entertained and made the audience laugh using exaggerated movements for humorous effects. Cinematic films started out as silent films. A type of genre in which their are no verbal communicates and talks in general. Due to this, films usually had slap sticks. These slap sticks made a sound, as though someone was slapped. These films also had chase scenes that are comical. An example of a chase scenes that involves running in circle. A famous actress during this age are Charlie Chaplin, well known for films such as “The tramp”. After silent films, films such as the Mr Beans became very famous.